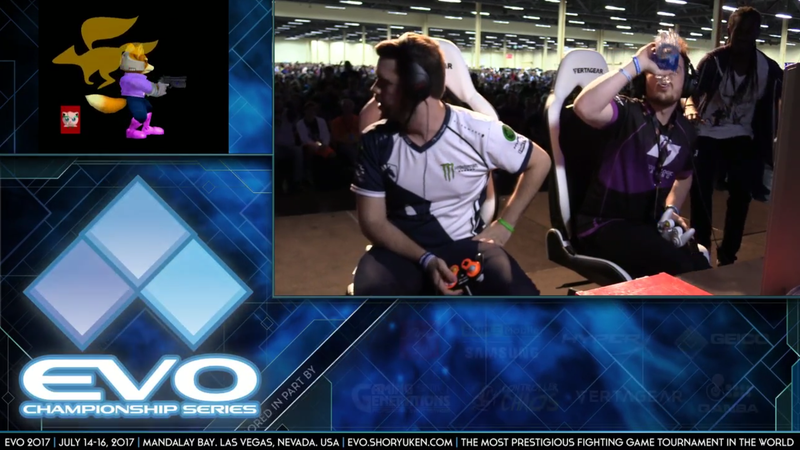 Super Smash Bros. Melee players Juan “Hungrybox” Debiedma and Zachary “SFAT” Cordoni both accrued yellow cards for receiving mid-set coaching TKduring their match in the top 16 at Evo 2017. The first instance occured when Debiedma called up his coach, Luis “Crunch” Rosias, after a game one win. After Cordoni bounced back to tie the set 1-1, Debiedma turned back offstage and lifted his headset, presumably to talk to his coach again. In response, Gordon “G$” Connell ran on-stage to talk to Cordoni, and the two play-acted a coaching session. Per Evo rules, there is no coaching allowed in tournament matches outside of pools. Joey “Mr. Wiz” Cuellar, head honcho of Evo, issued an official statement on the tournament ruling. After fans on Twitter commented on what seemed like a slap on the wrist, Cuellar clarified the reasoning behind the ruling. Some have argued that Connell approaching the stage should not be held against Cordoni in the same manner as Debiedma’s intentional call for coaching. Cordoni himself replied, saying he wasn’t even aware of an anti-coaching rule in the first place. The set ultimately ended in Debiedma’s favor 2-1, as he advanced into the top 8 on the winner’s side. His coach, Rosias, also made a statement on the matter.